Christmas is just around the corner! Twinkling lights, the smell of baked cookies wafting through the house, adorned Christmas trees in every shop and mall, visits from friends and relatives- the season’s festive spirit engulfs everyone and drives people to the malls, to midnight mass and to festive gatherings. Christmas is celebrated worldwide on 25th December to commemorate the birth of Jesus Christ. Christmas carols, an exchange of Christmas cards and gifts, church celebrations, a special dinner, Christmas tree, lights, garlands wreaths, mistletoe are the highlights of the festival. Christmas Day is a special day for little children who receive gifts that they have been longing for. Children eagerly wait for Santa Claus, or Father Christmas, a figure who is believed to provide Christmas presents to children. Many children write “letters to Santa” a few weeks before Christmas Day, asking for a gift that they desire most. Churches have special Christmas Day services during the day which include choirs, joyous singing, and meet-and-greet opportunities after the church services. Churches are beautifully & aesthetically decorated and may include a crèche or miniature Nativity scene. Some large-scale Christmas church services are televised for the benefit of those who do cannot attend a church service. In Brazil, a turkey dinner is made on the Christmas Eve. Saint Nicholas brings presents for children on December 6th. Christmas is a three-day event in Finland which starts with rice porridge and plum fruit juice Christmas Eve morning. Many families also visit cemeteries and put candles on the graves of their deceased family members. In Portugal, Father Christmas leaves gifts under the Christmas tree or in shoes by the fireplace. The special dinner is usually salted cod fish with boiled potatoes and is eaten at midnight on Christmas Eve. British families serve plum pudding after a large meal (usually turkey) and sometimes place a foil-wrapped gold coin inside for good luck! Get your friends together for a movie night to string popcorn, cookies and hot chocolate while watching Christmas classics like ‘A Charlie Brown Christmas’, ‘Rudolph the Red-Nosed Reindeer’ and ‘How the Grinch Stole Christmas’. In the spirit of spreading joy and cheer during the Christmas season, do random acts of kindness. Volunteer at a homeless shelter, or help with a local toy drive or food drive for those who have less than you do. Reconnect with family and friends by inviting them over for Christmas dinner. Or make an everyday dinner special by dining by candlelight. Pile the family in the car and drive around your town looking at Christmas lights. If you are a student, then drop anonymous notes on your teachers’ desks thanking them for sharing their gift of teaching with you. Or leave thank you notes on co-workers’ desks thanking them for being a wonderful colleague. Grab your siblings for a fun day of shopping gifts for your parents. . Try a holiday recipe from a different culture, like Mexican wedding cookies or Norwegian lefse. Visit the local library or bookstore and check out books about Christmas. Read a book each night till the end of December as a special holiday countdown. Call relatives and friends. Throw in a surprise call to someone who wasn’t expecting it. 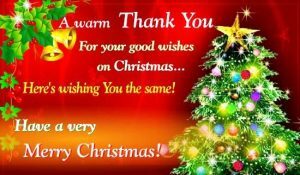 Thanks Rekha..hope you too had an awesome Christmas! Merry Christmas to you, Shaloo, and blessings always!